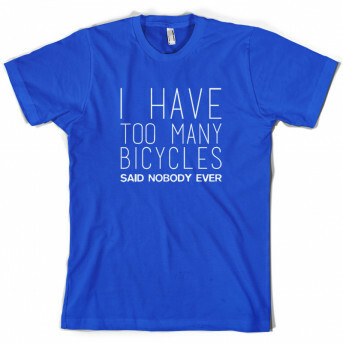 The perfect t-shirt for the cyclists who will never have too many bikes. Whether you fancy yourself as a Bradley Wiggins or Jens Voight, this bike t-shirt design is ideal for all cycling enthusiasts. Made from 100% cotton our Men's t shirt is a great casual fit and can be worn as a Unisex t shirt. Our ladies slim fit t-shirt is made from 100% ringspun cotton and is perfect for any cycling enthusiasts. Looking for something a bit thicker? Choose our 300gsm Unisex Hoodie, perfect for cycling in the British weather. Not quite what you’re looking for? Check out our huge range of cycling t-shirts to find the design that's perfect for you.